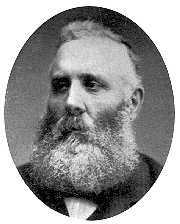 Barton, William Bell, second counselor to Bishop Orson F. Whitney of the 18th Ward, Salt Lake City, was born July 21, 1836, at Sutton Mill, on the Douglas river, near Wigan, Lancashire, England, son of John Barton and Elizabeth Bell. He was the first-born of his father's family and a twin brother of James Barton, now a resident of the Twenty-first Ward, Salt Lake City. William's mother became acquainted with the Latter-day Saints in 1840, and he began going to their meetings as early as 1841. His first serious impressions regarding the Latter-day Work were experienced in 1844, when he was a little over eight years old. They were caused by the recital by a Sister Charlson (who had lived in Nauvoo, Ill.) of her experiences in America, and her description of the martyrdom of the Prophet Joseph Smith. He was baptized by Elder Samuel Sharrett, Dec. 11, 1848, at St. Helens, in Lancashire; was ordained a Deacon May 25, 1852, and ordained a Priest Sept. 26, 1853, when he also was called into active service, and acted as clerk of the branch. Aug. 13, 1856, he was ordained to the office of an Elder by James Marsden. Soon after this latter ordination he was called to labor as presiding Elder in the Newton branch of the Liverpool conference. He was successful in his labors, and by the blessings of the Lord he enjoyed the privilege of adding some members to the Church. He hired a hall in the village of Haydock, in which to hold [p.668] meetings, but after fitting the place up for worship the Saints were only allowed to use it three Sabbath days, when they were informed that the hall could not be used any longer for religious purposes, as the owner of the building had received a notice to the effect that if he allowed any more meetings to be held there, the lease would be cancelled and the property taken from him. On reading the lease Brother Barton found that one of the conditions read as follows: "No landlord shall be permitted to let or rent any room, house or cottage, to any dissenters from the protestant church under penalty of confiscation." March 13, 1860, he married Miss Ellen Birchall, of St. Helens, and sailed from Liverpool on the ship "Underwriter," with a company of Saints, March 30, 1860, and arrived in New York May 1st. Proceeding on their way they reached Florence, Neb., whence, after a stay of five weeks, the company commenced the journey across the plains June 17, 1860, in an ox-train under the captaincy of James D. Ross, which arrived in Salt Lake City Sept. 3, 1860. Brother Barton was ordained a Seventy Feb. 16, 1861, by Francis Platt and became identified with the 62nd quorum of Seventy. He was appointed first lieutenant in company G, 4th battalion, 33rd regiment of infantry, Nauvoo Legion, Sept. 23. 1867. In the spring of 1873, he was called to fill a mission to the San Francisco Mountains, in Arizona. He made considerable preparation for the journey, but, in consequence of the unusual high water in the Colorado river that year, the whole company was released for the time being. In the latter part of May, 1874, he was called to go on a mission to Great Britain. He left Salt Lake city for that country, June 10, 1874, and arrived in Liverpool June 28, 1874. He was appointed to labor as a traveling Elder in the Liverpool conference, and later was called to preside over said conference, which position he successfully filled till he was released from his mission. He returned home Sept. 10, 1876. The following year (July 3, 1877) Brother Barton was ordained a High Priest under the hands of Daniel H. Wells, and set apart as second counselor to Bishop Lorenzo D. Young of the 18th Ward, Salt Lake City. About one year afterwards Bishop Young resigned, and on July 14, 1878, the Ward was reorganized, Orson F. Whitney being ordained Bishop and Brother Barton set apart as his second counselor, under the hands of Apostle Brigham Young. Elder Barton is still faithfully laboring in that capacity. From 1877 to 1893 he was employed as book-keeper in the mercantile house of the late Samuel P. Teasdel, and since June, 1900, he has served as a clerk in the Presiding Bishop's Office, Salt Lake City. William Bell Barton was born on 21 July 1836, at Sutton Mill on the Douglas River, near Wigon, Lancashire, England. He was the oldest of twin sons born to John and Elizabeth Bell Barton. His early life was spent much the same as other boys, going to school until he was eleven years of age, after which he did clerical work in a pawn shop before coming to America. "No landlord shall be permitted to let or rent any room, house, or cottage to any dissenters from the Protestant Church under penalty of confiscation." On March 13, 1860, he married Miss Ellen Birchell of St. Helens and sailed from Liverpool on the ship "Underwriter" with a company of Saints on March 30, 1860, and arrived in New York on May 1. Proceeding on there way, they reached Florence, Nebraska, which is now Council Bluffs. Then after a stay of five weeks, the company commenced the journey across the Plains June 17, 1860, in an ox-train under the captaincy of James D. Ross, which arrived in Salt Lake Valley, September 3, 1860. He had made the trek of a thousand miles across the plains on foot and endured all the hardships of pioneer life for his faith and belief in the restored Gospel of Jesus Christ. One of the outstanding incidents which occurred when coming across the plains was one time they were short of food and hadn't had any meat for a long time. One of the oxen drank poisoned water and died. So eager were the people for meat that the captain told them that if they would eat only the lean meat they might have it, but one man disobeyed orders and ate the fat which caused his death. William was ordained a Seventy, February 16, 1861, by Francis Platt and became identified with the 62nd quorum of Seventies. On June 10, 1867, he married Sarah Foster. He was appointed First Lieutenant in Company G. 4th Battalion, 33 Regiment of Infantry, Nauvoo Legion, September 23, 1867. In the spring of 1873, he was called to fill a mission to the San Francisco Mountain in Arizona. He made considerable preparation for the journey, but in consequence of the unusual high water in the Colorado River that year, the whole company was released for the time being. In the latter part of May, 1847, he was called to go on a mission to Great Britain. He left Salt Lake City for that country on June 10, 1874, and arrived in Liverpool June 28, 1874. He was appointed to labor as a traveling Elder in the Liverpool conference, and was later called to preside over the conference, which position he held until released from his mission. He returned home September 10, 1876. The following year, July 3, 1877, he was ordained a High Priest under the hands of Daniel H. Wells and set apart as second counselor to Bishop Lorenzo D. Young of the 18th Ward. About one year afterwards, Bishop Young resigned. On July 14, 1878, the Ward was reorganized, Orson F. Whitney being ordained Bishop and William was set apart as his second counselor under the hand of Apostle Brigham Young. From 1877 to 1893, he was employed as a bookkeeper in the mercantile house of Samuel P. Teasdel. He served in the presiding Bishops Office as clerk and also worked in the Waterworks Department of the city under Mayor John Clark. In his later years, he was made a Patriarch of the Ensign Stake and later President Joseph F. Smith appointed him to administer to the sick in the Latter-day Saints Hospital, which office he filled for five years. William was one of the first to pipe water into his house and helped put up the first flat bed printing press of the Deseret News. He spent the last years in the company of his twin brother, James. Their chief delight was making friends and telling of early pioneer experiences, and in this way they were well known as the "Barton Twins". After a very useful and spiritual life, William passed away at his old home, 157 "B" Street on October 1, 1923 at the age of 87.